Handmade paper flowers for crafts are an easy way to add pizazz to your projects. Flowers can be made using a variety of techniques and customized to fit almost any creative design you can imagine. Since the basic technique for most types of handmade paper flowers for crafts is fairly simple, these are good projects to try with young children. You'll need to supervise the use of scissors, but kids are sure to have a blast choosing the papers and embellishments to use with their flower designs. Paper flowers are also great for use in frugal crafts, since they can be made using small scraps of paper that would otherwise be thrown away. Cut a 12-inch strip of paper approximately one half inch in width. Trim one side of the paper using scalloped edge decorative scissors. Accordion fold the paper, using the scallop markings as the guide for each fold. Glue one end of the strip to the other to make a circle. Adhere flower to paper backing and add a button center to the middle. Punch six small hearts from coordinating patterned papers. Arrange the hearts in a circular shape, with their bottom points facing the center. Add a button or a brad for the middle of the flower. Hand cut four progressively smaller circles. Make two from cardstock and two from patterned paper. Run a black or brown ink pad along the edges of each circle for extra definition. If desired, gently sand the cardstock circles to reveal the white core of the paper or crumple the patterned paper circles for added texture. Glue the circles onto your project from largest to smallest, topping with a button or brad flower center. Flatten a cupcake liner and draw a spiral pattern on to the liner with a pencil. Color along the outside edge of the spiral using a marker that coordinates with the liner color. Glue the spiraled liner to a two-inch cardstock circle, creating a ruffled pattern. Add a bit of liquid glue to selected areas of your flower, then sprinkle with glitter. When you don't have a flower stamp handy, use a capital letter O to make a cute daisy. Stamp a series of Os in a circle. Use watermark ink for a tone on tone look or choose a color of dye ink that contrasts with your background paper to make a more dramatic flower design. Add a button, brad, or patterned paper circle to the middle to make your flower center. Make three to five progressively smaller flowers from coordinating papers using punches or a die cut machine such as the Cricut Personal Electronic Cutter. If desired, add glitter to the edges of some of the flowers for a fun sparkling effect. 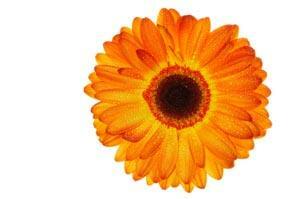 Arrange the flowers from largest to smallest, then add the desired center to the middle of your flower.